We are happy to welcome you at the BinPartner financial affiliate program of the Binomo trading platform. The company has been operating on the market since 2014. 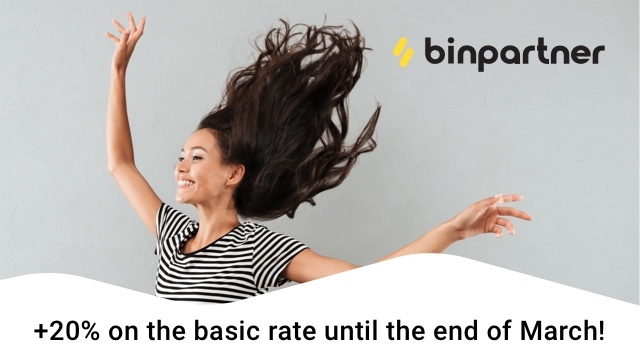 BinPartner doesn’t only mean unique working conditions, but also maximum profit! 1. 50% of the revenue share from all the partner's client deposits. 2. CPA up to $500. 3. CPL under individual conditions. - a mobile app for Android and iOS. The affiliate program works with traffic from different countries. Cooperation with BinPartner is convenient for any webmaster or arbitrator. It doesn’t matter if you have experience in a financial niche or not. The highly qualified managers of the affiliate program will gladly help and advise you on any issue. Start working immediately: there is no need to go through any interviews, you can begin immediately after signing up. All partners have the unique opportunity to order exclusive promo materials, thematic articles for a specific resource for any locale, and that’s not all. The gallery of ready-made promo materials is also always available for use. Last edited by BinPartner; 11-13-2018 at 11:34 AM. When your friends become partners of Binomo, you earn through the referral program. Ask your personal manager for details! We have an updated “Promo” section for you! There aren't any old logos there now, only the new ones. And they're available in any size. Choose what you want and use them actively to attract new Binomo clients! New Year's will soon be here, so it's time to sum up the year. - 25 843 new partners. Our team is infinitely glad that you're working with us! 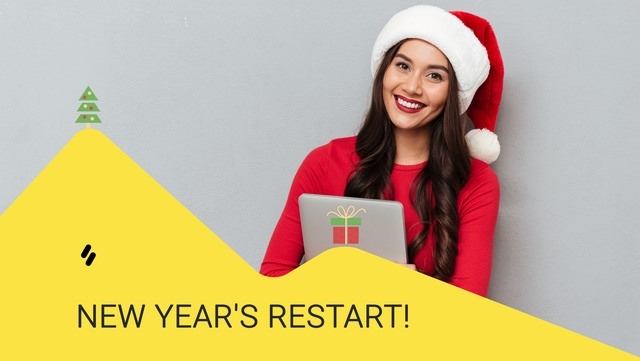 We are grateful to you for the new clients and we'll do everything we can so that in 2019, we can achieve even greater success together! Over the New Year's holidays, payments will be made as usual! On Thursday, January 3, you will receive the funds you earned for the previous week as usual. We will continue working in Russia! It's true, we are more interested in other countries, but we'll still accept traffic from Russia. Have friends who aren't working with us yet? Engage them soon and get good referrals! 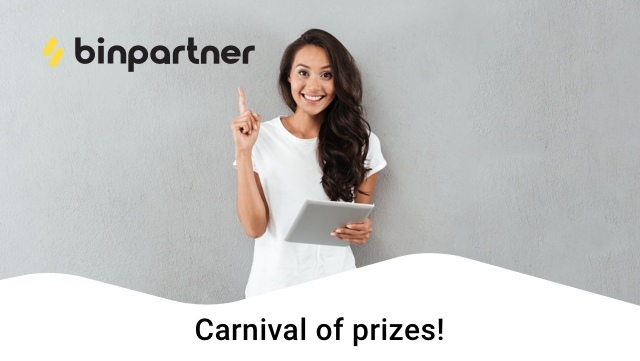 Moreover, there's a great reason to do so: starting January 14, we will again launch a contest for new partners for traffic from Indonesia, Brazil, Turkey, and India. 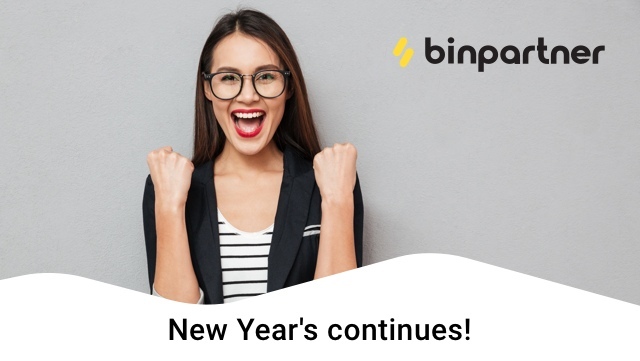 Sign-up of participants in BinPartner will open on January 1. Every Monday we will choose winners to receive large monetary prizes. Get the details from your personal manager! Do you think that only partners with a lot of experience can earn well? Beginners can also make a profit for attracting clients from their first days of work. Not sure? Read a true story about a new partner, get inspired, and drive even more traffic! Take care of your profits! Our partners work hard and for that, they regularly receive payments in their accounts. Of course, fraudsters sometimes try to hack them. We always send notifications about changes of passwords or payment information to your email. So please make sure you entered it correctly. If there's a problem, your personal manager will help. It’s impossible to crack a complex password on our website. That's why you should change your easy password and double check all your information! While we're all just getting over the holidays, in Vietnam they are just about to celebrate New Year's! Of course, we have a cool promotion for this event. Traders can double their deposit using the promo code TET2019 and get a chance to win a Binomo branded hat. And affiliates are an excellent information method that will definitely come in handy in an advertising campaign for Vietnam. See the promo page and use it to attract new clients! Yoo-hoo! We've got something new! A new landing page for Indonesia! Just wonderful. In order to avoid issues with account crediting, we've made video guides for India, Indonesia, and Vietnam! Very simple and straightforward. Download them on our YouTube channel and show them to your new clients. Did you carefully study the affiliate agreement? It's time to learn more about our relationship! 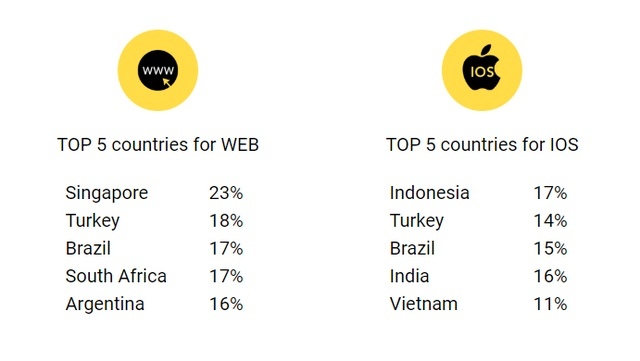 We analyzed audiences and ranked the highest conversion countries. Want to know how you can get started in these countries? Ask your manager! We are happy to inform you that we have sent your payments of funds earned over the period from 04.02 to 10.02. Please check your wallets. We're starting on February 18! By the way, conversion in Brazil has already reached 17%! Interested in working with this country? Write to your manager now! — Brazil isn't the only profitable country to work with. Attract new clients from CIS countries! As soon as you start working with these countries, you'll get bonuses from us! Write to your manager to learn more about everything. We are happy to inform you that we have sent your payments of funds earned over the period from 11.02 to 17.02. 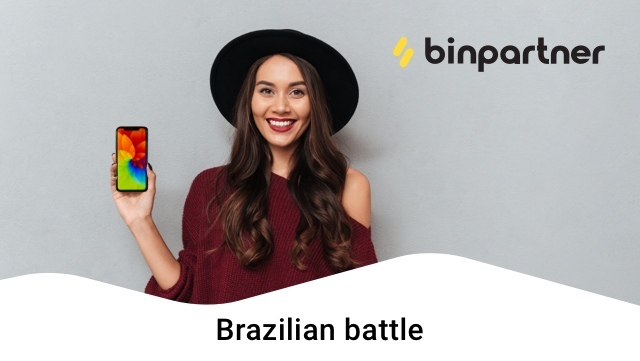 Drive traffic from Brazil and participate in a competition! We will sum up the results on March 18. — promo materials to help you attract your audience. Just make a few clicks. We are happy to inform you that we have sent your payments of funds earned over the period from 18.02 to 24.02. Please check your wallets. — hey, newbie! 200 million people live in Brazil, so how many new traders can you attract from this country? Take part in competitions and win a prize! And if you've been with us for a long time, bring your friends: more people means more traffic. Attract traders via mobile and beat your conversion record!